With the primary elections going on, I realized that Charis knows very little about who have been the Presidents of the United States. I want my children to have a better knowledge of history than I do. In high school, my history teacher, from 10th-12th grade, had us write down outlines verbatim. The day before testing us, he would give us a "review" with all the test questions and answers. I'd regurgitate the answers on paper and immediately forget what I learned. I wanted a book that is simple for Charis to understand, and yet memorable. U.S. Presidents: The Oval Office All-Stars includes all 44 Presidents of the United States. Each President is given one page with 6 bulleted facts and a 2 paragraphs written in first person. Each President has a cartoon depiction on the opposite page. 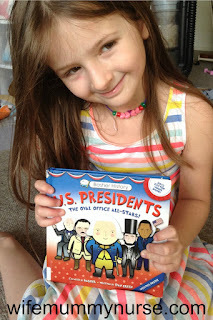 I plan on reading a different President each school day to my daughter, enough to help introduce her to the names. 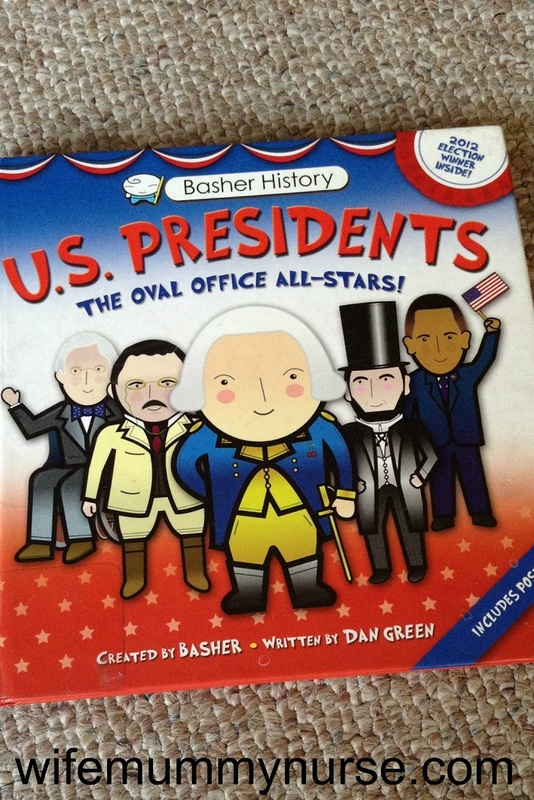 What books do you like about the U.S. Presidents? Who is your favorite President? It's awesome that the book is so simple and to the point. There are a lot of presidents and it can be tough to remember too much about each president. I recently saw some wood blocks featuring all of the presidents of the US at an artsy store. 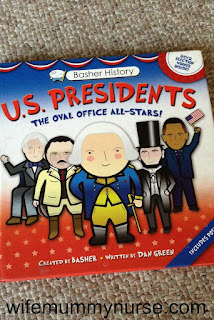 I thought that was an interesting way to teach kids about presidents, although I have no idea how it would work in practice. Thanks for sharing. Hopefully your plan works and she remembers what you are teaching her. Do you have any plans for reinforcing this knowledge after school or on weekends to reminder her of what she's learned or see if she remembers what you both talked about earlier in the day/week?